Burnley boss Sean Dyche is getting a lot of satisfaction out of watching the way his side have defended so far this season. The Clarets have conceded just five goals in seven outings in the Premier League despite having played four of last term's top seven away from home. Match of the Day pundit Phil Neville recently hailed the club's 'unbelievable' art in defending after taking in the 1-1 draw against Liverpool at Anfield, adding that it looked as though the Clarets 'enjoy defending'. And the one-time Manchester United defender was in Merseyside to witness another defensive masterclass as his former employers Everton failed to find a way through at Goodison Park. Remarkably, the Clarets are conceding with every 29th attempt on goal and from 147 shots against them only 31 have been on target. "I know it’s a positive comment," said Dyche. "But it sort of represents that we want to defend, we don’t, we want to attack. "But when you’re playing Liverpool at Anfield it’s sometimes difficult, you end up defending by the power of the opposition and that happens a lot in the PL, not just to us, a lot of sides away from home don’t have the ball as much. "Ours is probably more exaggerated at certain grounds, with Liverpool being one of them. If you are defending you’ve got to defend right, from organisation and with an individual will and demand to make sure you get something from the game. "I think we’ve done that over a longer period of the time, even in the Championship when we were more dominant with the ball we still defended well. "It’s an important part of the game, it is there to be enjoyed and there’s a belief and a confidence that comes from that." Statistics are certainly backing up Burnley's defensive prowess, which is a well-oiled unit throughout the three banks, with players heading the top flight charts. Central pairing Ben Mee and James Tarkowski have made the most blocks with 15 apiece while Jack Cork sits in third with 12. Tarkowski has also made the most clearances in the division with 74 and Mee is just behind in third with 65. The duo are also hot on the heels of Brighton's Shane Duffy who has made 52 headed clearances to date. Mee is just one behind the Seagulls' defender while Tarkowski is one adrift of his team-mate. 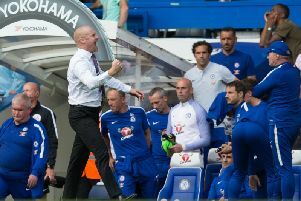 "Most managers down the years have believed success starts with defending properly, not all but a lot of managers believe that," said Dyche. "I’m not trying to reinvent the wheel, I’m just trying to make the best wheel I can. If many top managers think that’s an important factor then it probably is. "I was a defender, I think I know how a team should defend as a team, not just the back four, I think the whole team has to defend, more so in modern football. "There’s a lot of build-up from the back of the pitch so you're centre forwards need to know how to defend better than they did 15 or 20 years ago, because there’s a much higher demand on managers now to play back third football, so the strikers need to know how and why to defend, their distances and coverage to break the play down early in a move. "People are talking about the number of shots but we all know the quality of chances is the key, particularly the higher up you go. Any team can shoot from 30-odd yards and put it 20 yards over the bar. "Within the number of shots against us, I don’t think there have been that many golden opportunities. If a team keep shooting from 35 yards, they’ve a lot less chance than if they’re shooting from 10 yards. I think our defending has been resolute and the organisation has been very good. "We work with what we’ve got, we work in the right fashion so that they enjoy the nitty gritty of the game as much as they enjoy the attacking side, because that’s important to what we do here, and the players know that, they accept that."